Grand Escape Cottages comprises 12 cabins on .85 acres with lake and mountain views in a prime location in the center of Grand Lake Village. THIS IS NOT JUST A HOUSE-IT'S A WORK OF ART!! !Three story built upon purchase in the center of Grand Lake. 3+ Acres sitting at the top of Mountain Shadows Estates with beautiful views of both Lake Granby and Shadow Mtn. Lakes. 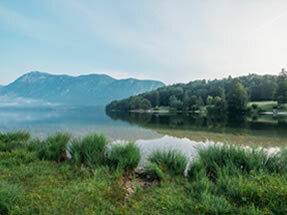 Panoramic views of Shadow Mountain Lake and the high mountain of Rky Mtn Nat'l Park. Paved road access, central underground utilities. Covenants. Immediate access to Shadow Mtn. 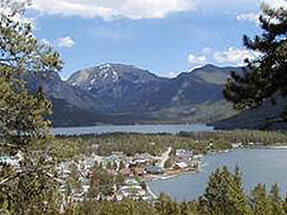 Lake and the Continental Divide Trail in Rky Mtn Nat'l Park and Arapahoe National Forest. Mountain top lots sold together with amazing views and close proximity to National Forest, hiking, atv, snowmobiling, wildlife and lakes. OWN A VERY PROFITABLE GROCERY BUSINESS IN GRAND LAKE. Beautiful D-Log cabin on a quiet cul-de-sac in Wildacres with mountain and lake views and a 2 car garage for storing all of your toys. PRICE REDUCED TO $465,000. Beautiful cabin, recently remodeled with excellent finishes on a quiet cul-de-sac in Columbine Lake. Cute 3 bd/1ba cabin on a quiet cul-de-sac in Columbine Lake. Nicely remodeled on a commercial corner lot with new kitchen, cabinets, hardwood floors, new windows, new bath and front deck. 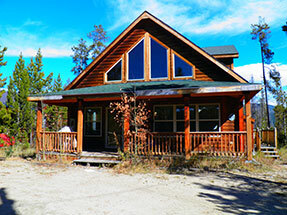 Beautiful residential site on Tonahutu Creek and bordering Rocky Mtn. Nat'l. Park. Beautiful top of the mountain easy build site with continental divide, lower ranch views and quick access to Arapaho National forest.